Our government is out of control… and we are seriously close to losing our liberty! This Painting Shows Obama Standing on our US Constitution! The lone man sitting on the bench is the “Forgotten Man,” who represents all the American people whose rights are being trampled upon and stolen from them by politicians, including both Republican and Democrat, who each swore an oath to Preserve, Protect, and to Defend our U.S. Constitution! This picture represents what these politicians, on both sides of the political aisle are and have been doing for quite some time now, under this (unconstitutional) de facto D.C. Corporation. Our Founding Fathers set this government up to operate as a Constitutional Republic! We were NEVER intended to be a Democracy, which means majority rule; but rather our government operates by and through a contract with the American people, as a government of the people, by the people, and for the people. It’s a government based not on majority rule, as in a Democracy but on the Rule of Law, with that law being our U.S. Constitution! Subsequent to our being made a Corporation in 1871, little by little our rights have been stripped away over the years, as this D.C. Corporation more and more presumes to itself , through the Federal Government, rights and powers that are not allowed in our organic Constitution, as it was written by our Founding Fathers. Things have gotten really bad since 9/11. First, it was former President Bush who through the Patriot Act stripped away our 4th Amendment rights. The Fourth Amendment to the United States Constitution is the part of the Bill of Rights which guards against unreasonable searches and seizures, along with requiring any warrant to be judicially sanctioned and supported by probable cause. Today thanks to former President Bush none of these Rights apply to us anymore; where the government can today, just on its say so that you are a suspected terrorists, without any supporting or collaborating evidence being required or due process, they can at anytime seize your private property, tap your phones, read your emails; and there are no more 4th Amendment Rights to protect you. Then in 2009 Obama, through the passage of the National Defense Authorization Act (NDAA), he did away with both our right to Habeas Corpus and also our 5th Amendment Rights, against unlawful detention. NDAA suspends our rights under Article 1, Section 9 for a writ of Habeas Corpus, which requires a person under arrest to be brought before a judge or into court. The principle of Habeas Corpus ensures that a prisoner can be released from unlawful detention—that is, a detention lacking sufficient cause or evidence; and the remedy can be sought by either the prisoner or by another person coming to the prisoner’s aid. So again under either the Patriot Act or NDAA all the government has to do is say you are a suspected terrorist, and they can do so without any evidence at all, and you no longer have any rights whatsoever to protect either your person nor your property! Also in a memo that was issued by the Department of Homeland Security back a few years ago, under Obama, it said that the biggest threat we face today comes, not from any Islamic terrorist group, in fact Obama has even put a number of these Islamic extremists on his staff. According to this Obama administration it is now returning veterans and right-wing Christians who are the biggest threat! In short that means anybody who still believes our government should operate according to our organic Constitution, or anybody with a Judaic/Christian belief system, according to this new policy under Obama, these are people who are the terrorist threat today! But of course our government would never misuse this power… right? Yeah sure… if you believe that I have some really good swamp land I’d like to sell you! Today these criminals, and that’s exactly what they are, don’t even pretend to follow our U.S. Constitution; and the courts are backing them up!!! Does that tell you something? Well it should… it should tell you that we are in serious trouble! The Constitution for the united states of America is the Supreme Law of the Land, and it states in Article VI, paragraph 2 that ALL statutes and laws enacted by Congress must be in harmony with the Constitution! Any statute or law enacted by Congress that is in contradiction or disharmony with the Constitution is null and void from the beginning. It creates no duties, creates no rights, imposes no obligations or duties upon any Citizen of the united States of America. It is as if it never existed. Marbury v. Madison, U.S. Supreme Court decision, 1801. “…all executive and judicial Officers, both of the United States and of the several states, shall be bound by Oath or Affirmation, to support this Constitution”, Article VI, paragraph 3. When we refer to the Preamble of the Constitution we find this statement, “…do ordain and establish this Constitution for the united States of America. Now this leads me to the point of my blog today. Below is an email and video that I received today from Col. Harding, followed by my response, both of which I’m passing along to all of you as an open letter. Please take the time to view the video, as it states the case for our maintaining and keeping our Second Amendment Rights intact, which by the way states in no uncertain terms “that our right to bear arms SHALL NOT BE INFRINGED;” and also in this video support for the NRA is being voiced as well, and all of this is coming from various leaders within the Black community, no less. Right on!!! For those who may not have heard of him, Col. Harding he is today the highest decorated (living) veteran, and I’m happy to say that we both are on the same page when it comes to this ongoing takeover of our country. More folks on our side. The 14th Amendment was NOT as much about emancipating the slaves, as it was about enslaving the entire nation under this dictatorial oligarchy of Globalist Bankers, all of which is the biggest ponzi scheme ever perpetrated upon the American people, with the passage of the Act of 1871. However it is my firm belief that we here in the United States DO NOT have to be a part of that monstrosity. Does it not occur to anyone that the way this New World Order is to be structured it will be outside of the lawful boundaries as stated in our Constitution; and it will require our surrendering of both our sovereignty and our Constitutional Rights to what well ultimately be a totalitarian One World Government?! The thing I don’t get is where do these people, these politicians, who have ALL sworn an oath to Preserve, Protect, and to Defend our organic U.S. Constitution, get off endorsing and promoting a completely new form of government that is a complete anathema of everything our Constitutional Republic stands for; that would ultimately enslave our entire population under the rule of this evil “Globalist” oligarchy? May God help us to rid ourselves of these self serving, dishonest, and greedy politicians, who could care less about doing what’s right for our country, or even keeping their oath of office! There is not even a pretense on the part of these politicians today of them keeping their oath of office; and which by the way there is also no oversight or enforcement to see that they do keep it. Congress polices itself, which means they just give lip service to our Constitution, but that’s about it… and the courts are backing them up! If this is allowed to continue we are in for some serious trouble in the not too distant future! Consider for a moment that our national debt today is at $17,000,000,000,000 (Trillion) and I can tell you that the laws of economics are soon going to come home to roost here in America. It is unavoidable, after all these many years of irresponsible and wasteful deficit spending, where we have operated in the red for the last 100 years, without one balanced budget in all that time. Then to make matters even worse, this private corporation called the Federal Reserve Bank, which is both owned and run by this same Bankster oligarchy, over the last 100 years (ever since the Federal Reserve Act of 1913 was passed) they have been robbing us blind, through their control over our banking and monetary policies. As illustrated in the above graph, with respect to the constant decrease in the buying power of our U.S. Dollar, over the last 100 years, it is this constant cycle of inflation and deflation, both of which is manipulated by these Banksters, that also in turn fuels inflation, that has over the years caused this to happen. This is especially true ever since they have taken us off the gold and silver standard; and have since replaced our currency with worthless “debt certificates,” called “Federal Reserve Notes,” which is not even a lawful currency, because it is backed by nothing but our $17 Trillion debt. You want to know the cause of why our dollar is so weak today and why our economy is on the verge of collapse… well this graph tells it all! You cannot keep spending like we are and keep taking our nation deeper and deeper into debt, and at the same time flooding our market with worthless fiat currency, and think that this house of cards is not going to fall… because it most certainly will, and soon! 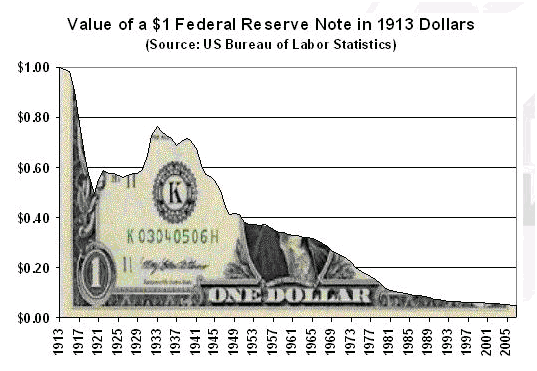 Just wait until the USD is no longer the Reserve Currency of the World. There is absolutely no way we can ever pay this debt off, and the government accounting office even admits that; and what does Bush do, he gives over $700 Billion of our tax dollars to the very same Banksters who caused the problem in the financial melt down in 2008. To make matters even worse, it is my understanding that 40% of that $700 Trillion dollar bailout money is still unaccounted for; and yet still today there are no bankers who are under criminal investigation, and there are no indictments. Folks, what’s wrong with this picture… do I have to spell it out for you? These people who are controlling this Corporate pyramid, from the top down, both directly and behind the scenes, who are intentionally destroying our country, they are all traitors and criminals! Here Bush does this in order to bail his Banker buddies out and keep them afloat, while the rest of the country is going broke! If he had given that money to the American people instead, every single mortgage in America could have been paid off. Don’t you think that would have helped the country and our economy out a lot better than supporting and abetting the very same white collar thieves and criminals who caused the melt down to begin with? Before we can correct the many wrongs of our nation’s government, and set it on a sure godly footing again, with a law abiding and constitutional government, we have to first repair the cracks in our foundation, and remove the leaven of corruption that pervades our government today, at all levels. Have you ever asked yourself why is it against the law for us to lie to Congress and yet they lie to us every time they open their mouth, pretty much, with absolutely impunity! Haven’t you noticed that this government business among our Congressmen and Senators today, and even our President, as career politicians, has become very profitable for them. I mean think about it, they have a Cadillac healthcare system, and of course they won’t be under Obama Care, like the rest of us; they also have voted themselves a golden parachute for their retirement, and they only have to serve one term (which is 4 years) to qualify for it… not only that, but it is payable to them for life. That is certainly better than any of us have! I mean they must really think a lot of themselves, wouldn’t you say… which shows a high level of egotism on their part, in light of the dismal job they have and are doing for our country?! Hey, I thought they were supposed to be working FOR us, as our public SERVANTS. The problem is, that is not the way corporations operate. They never operate from the bottom up! Ever corporation operates from the top down, do they not? While on the other hand, a Republic always operates from the ground up, from “We the People;” and these elected officials are elected to represent our interest. In a corporation the fiduciary responsibility goes to the stockholders (who are the owners of the corporation), and the officers of the corporation, who is the Congress, answers to the board of directors. Under this de facto system that we have today in Washington D.C., it is the Banksters, the same people who own and control the FED, which is a privately held corporation, who make up both the board of directors and the stockholders; and therefore they are the owners of the corporation, and “We the People,” as it were, exist only as their employees. This is the way every corporate pyramid is structured, from the top down; and under this system we in fact work for them! The fact is they don’t think any of us are smart enough to figure this out! It is absolutely imperative that we restructure the foundation upon which our original government was built, by going back to our only de jure (lawful) form of Government, which is a Constitutional Republic… and not a democracy or corporation!!! Anything else is only delaying the inevitable, like polishing brass on a sinking ship; and believe me this is all being done on purpose. My prayer is that God either changes these people’s heart, these people who are suppose to be our public servants, or that He remove them from office; and that we rid our country once and for all from the corrupt influence of this den of thieves, these “Globalist Banksters,” before they have any more time to destroy this country, by bringing about the evil destiny they would like to see implemented. It certainly worked for our founding fathers and it will work for us! It should be required of them in order to hold office. However to enforce the Constitution, and to make sure these people actually adhere to their oath of office, we should have the same penalties that apply to government officials that use the power of their office to violate an individual’s Civil Rights, where they are each individually liable for any and all damages! We need to have that same system set up to ensure that these politicians, judges, and civil servants keep their oath as well. If you want to see the fear of God put into these people and a change in attitude happen overnight, in politicians, judges, law enforcement and everybody else in this de facto Corporate system, I can tell you that would sure do it and it would light a fire underneath them all!!! I am just so frustrated by all the blatant dishonesty and really just criminal actions that this de facto D.C. Corporation is attempting to ram down the throats of all Americans today. Everything they are doing is about gearing up for marshal law and stripping us of all our freedoms, just like what happened in the former Soviet Union and in pre-Nazi Germany; which by the way, the Bolsheviks Revolution that led to the Soviet Union coming into power, and also Hitler and the Nazis taking over in Germany, both of these movements were financed by these very same bankers. We are talking here about some very EVIL people and it is just so amazing to me that the people of America cannot see this, and that they are putting up with it!!! Our founding fathers and the people who fought for our freedom during the Revolutionary War would have long ago run each and every one of them out of town, and out of the country on a rail. As I remember, Bill and Hillary used to say the same thing. This just burns me up, I mean where do these people come from; and what is wrong with the American public that they can’t see what’s going on? These politicians who are promoting this “New World Order,” and in the process are trashing our U.S. Constitution, in my opinion, they are each and every one criminals, and worse they are traitors to our country! Everyone of them needs to be brought up on charges for Rico, and for treason… starting with the President who has done nothing but lie and defraud the American people for his whole political career! It’s so hard to believe that so many people can be so gullible and naive! Amen! May the Lord empower his Body to do and teach concerning His kingdom. Previous Previous post: A Lesson in Life… Take courage, God also has a “Pony” for you! Next Next post: Sounding the alarm for these last days…. let us all be mindful and listen to what the Spirit is saying to the church today!